OK - so who has been playing Disney Emoji Blitz? I am *so* hooked. I don't think that there has been a day I haven't played since I downloaded it, and I love getting the little images to pop into my texts. 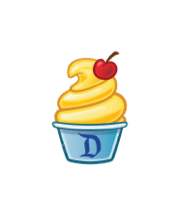 I think the Dole Whip is probably the one I use the most. I only wish that they were actual emojis and I could use them other places instead of small images. Love the game! Hate that you have to grant full access to gain use of the emojis. This is not something I would ever, ever feel comfortable with. Hate that you have to grant full access to gain use of the emojis. I sold my soul to Disney a long time ago, I'm just waiting for the implant. Oh and I like when your prize is 3 or 5 lives! I think one of the best things about this game is how quickly your lives refill. No waiting 24 hours like most of this type of games. I haven't used the emojis yet. I gave it access but I can't seem to find where they are and how to use them. Sometimes, technology stumps me. Othertimes, I can reprogram a laptop with my eyes closed. The emoji use is kind of a pain, on the iPhone you have to go into your keyboard settings and add it as a new keyboard. But you can't actually use it that way, you have to cut and paste them into texts. It's sort of a pain. I love all the free prizes and how fast the lives refill too! I think I'm on level 21 right now and the missions I have to accomplish have started getting harder, I don't think I'll be leveling today. I usually just play at night, I'm usually a couple days for a level. I'm on 15 now with 5/15 done. For some reason on this game, I have a hard time seeing the matches. I have no issues with Candy Crush or Bejewled. I don't know if it's the details on the characters or what. It sounds really weird and it drives me batty!!! The problem with giving any app/keyboard full access is that they have now have access to every keystroke you make. From credit card numbers to passwords and anything in between. While I trust Disney and I hope they are not aggregating such sensitive information, their IT department leaves a lot to be desired. That worries me regarding the security of my personal information. I really try to limit how much information I allow 3rd parties to access just for own sense of security and probably a little bit of paranoia. Bummer because from what I have seen the emojis are very cute! Is anyone playing the Ursula Event? Are you enjoying it? How far along have you gotten? Have you opened a skull box yet? I'm on the first skull box round right now so I'm still not sure what's inside. Overall I'm just sort of "meh" regarding the event. I'm doing it. I am one away from the box and that is the only reason I keep playing. I want to know what is in that box!!!!! I like the regular challenges better. Thanks Kristen, it's a great game! I also love the live refill time - things like candy crush take forever. I played for a few days just to get a few emojis to use for texts. I used to be hooked on Bejeweled Blitz pretty badly and I'm trying not to backslide! LOL. I'm currently playing a lot of Disney's Magical Dice by Net Marble and Magic Kingdoms by...Gameloft maybe? But sadly, I think I'm done. I was a little disappointed and I don't know that I care enough about the event to finish the whole path. I'm going to go back to the regular game now and get back to collecting castles. I got the skull box also! I kind of figured that's what it would be. And I too am done.